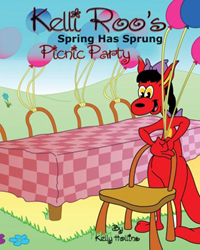 Within the pages of Kelly Hollins’ new book, Kelli Roo's Spring has Sprung Picnic Party, ($12.99, paperback, 9781498411059; $6.99, e-book, 9781498411066) readers will be introduced to Kelli Roo – a kangaroo who was born with a golden birthmark on her chest in the shape of a heart. Whenever Kelli Roo does something nice for others, her golden heart begins to shine. Kelli Roo is a positive, loving character that shows her love by helping everyone she meets. This story follows Kelli Roo’s pursuit to plan, prepare and host the “First Annual Spring Has Sprung Picnic Party.” Children will delight as Kelli Roo creates and delivers the invitations with her best friend, Wally, decorates for the picnic, finds her lost guest, and even saves a little kangaroo who was in danger. She accomplishes all of those tasks while helping her mom and dad, and making friends and neighbors laugh and sing with her kind words and loving heart. Captivating brightly colored illustrations are sure to keep little readers focused on the exciting story. Kelly Hollins has worked with foster children for over 15 years. She understands the importance of performing acts of kindness and to be polite and respectful to others. This is her second Kelli Roo book. Her first book, Kelli Roo – The Kangaroo with the Golden Heart, also provided the message to bring about positive actions in children and inspired them to live with a golden heart. Xulon Press, a division of Salem Media Group, is the world’s largest Christian self-publisher, with more than 15,000 titles published to date. Retailers may order Kelli Roo's Spring has Sprung Picnic Party through Ingram Book Company and/or Spring Arbor Book Distributors. The book is available online through xulonpress.com/bookstore, amazon.com, and barnesandnoble.com.